An outdoor bistro set is all you need for a complete patio look. So we are here to help you with our best outdoor patio bistro reviews. Before we begin reviews let us inform you that, our list covers almost all types of bistro set. And by that we mean, you will come across iron bistro, folding bistro, bar height bistro and many more. Owing an outdoor bistro table set gives you freedom to enjoy outdoor environment comfortably while having your coffee. Especially during spring and summer, all we want is to spend good time outdoors. And to make your leisure time more comfortable, we present you the best outdoor bistro set for patio. Apart from placing the bistro set in patio you can always place them in small balcony, deck or garden. Therefore, enjoy breakfast, lunch or dinner in own small bistro set. 13.1 1. What is an Outdoor Bistro Set Furniture? 14 2. 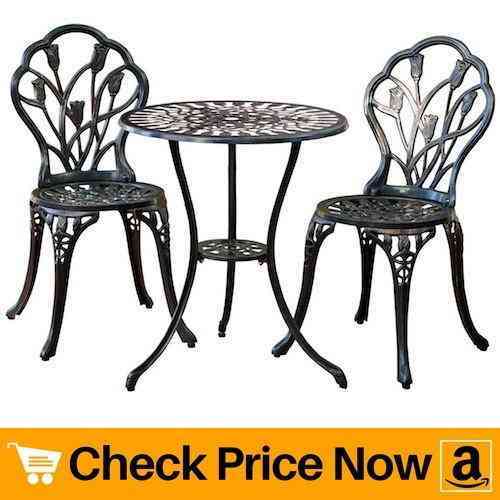 Should I buy Metal Bistro Set or Wooden? Antique looking outdoor furniture always remains in fashion no matter what. So is our first product from best choice. 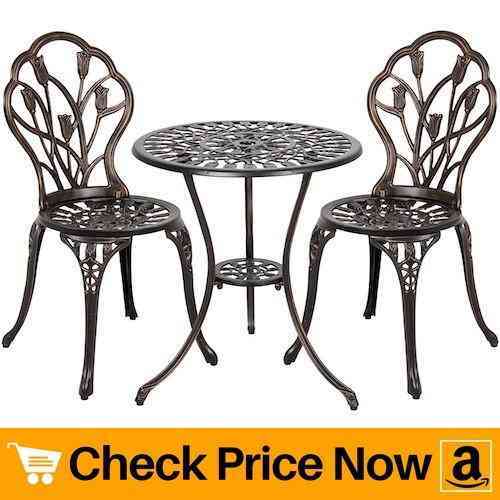 This outdoor bistro set have beautiful tulip design in table and chairs with an antique copper finish. The reason why it remains hot favorite is because these type of bistro sets easily matches with patio. And if you do not have patio, they undoubtedly make your porch or gallery look beautiful. 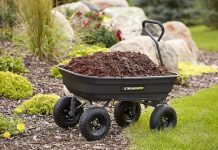 Rust-free aluminium construction of the unit makes it strong and sturdy. Apart from that, the table contains umbrella hole in the center. Thus, you can easily fit patio umbrella in order to keep yourself under shade during hot weather. Using umbrella not only keeps you safe from sun, but it also prevents bistro set from fading and rusting. 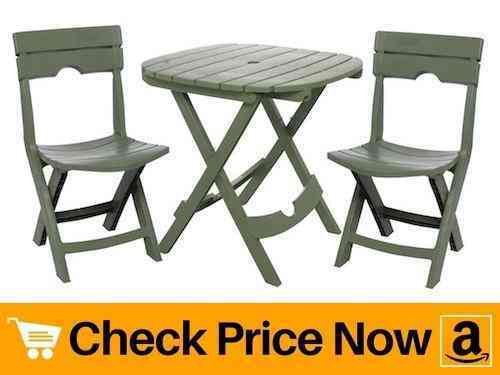 Overall, this is best small outdoor bistro set with a fair price. And not to mention, but the heaviness of the product concludes that the unit is strong enough to last for years. Comfort is more important than style when you really enjoy spending long hours of time outdoors. So our next product from mainstays offers 3-piece outdoor bistro set with cushions. The butterfly design on the cover of cushion gives modern touch to the entire unit. Along with that, glass table top adds beauty to the area along with two chairs. Plus the size of table is relatively large than regular table size. Hence, you can easily fit two plates and glasses. Metal frame of chairs and table remains strong and sturdy for years. Also weight of the metal protects the unit from fleeing away during high winds. For added comfort, the cushion comes with clips to keep it in place. However, you can easily remove the clips and cushions in case they get dirty. As the cushions are not weather-resistant they will get dirty over time. But no worries, you can always remove them, wash them and clip them again. If budget is not a barrier then you will definitely fall in love with this product from great deal. 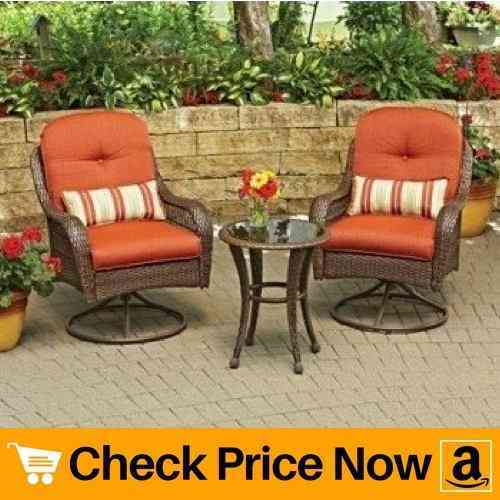 This premium outdoor bistro set with cushions will definitely provide you comfort along with style. In addition, the faux wicker with powder-coated iron frame is weather resistant. Hence, it is durable as well as resistant to UV rays and water. All you will get is strong and sturdy material of table and chairs which will last for years. Polyester material of cushions makes them weather-resistant. Unfortunately, the cushions are not sunbrella material but they do resist water. So it is best to keep cushions inside during rainy season and snowfall. Though the cushions does not have velcro straps, they perfect fit in the chairs and do not move around. Lastly, the glass table-top really goes well the chairs and have a relatively large surface. 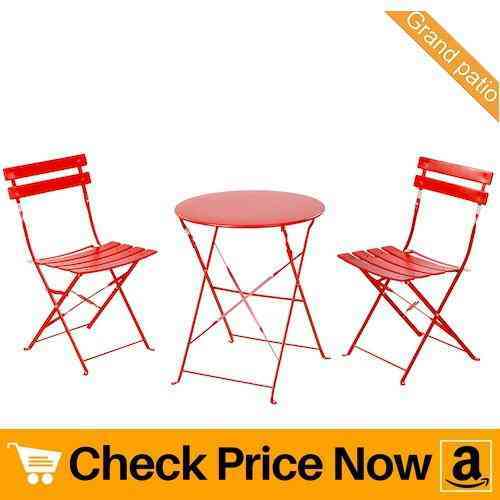 Overall, this is one of the best outdoor bistro set that is not going to fade so easily. For long life of patio furniture you must always cover them during harsh weather. And if it is not possible to cover them, you must shift the furniture indoors. But certain furniture are difficult to shift because of its heavy weight. 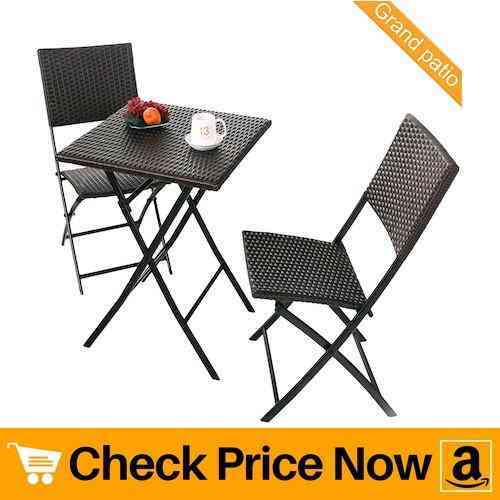 So next on the list we have a folding bistro set from grand patio. Its vibrant red color is eye-catching as well as beautiful. And above all, table and chairs are light in weight and fold-able. Therefore, you can simply fold them and carry inside during bad weather. Wide and thick steel bars on seat panel and back makes it comfortable to sit. Plus it contains small plastic pieces at the bottom of chairs and table. Having plastic foot is really important in case you wish to install your bistro set in deck, porch or patio. It simply prevents scratching onto the floor due to movement of furniture. Besides that, an individual chairs can hold weight up to 280 lbs. Thus, it is a small and strong wrought iron bistro set. Now this product from giantex offers the same tulip design as first item on our best outdoor bistro set reviews. Two main differences between first unit in the list and this one is manufacturing company and designs. Giantex offers leaf design and rose design bistro set apart from tulip one. So therefore, you have three options to choose from. Otherwise, all features are same including umbrella hole in the center of table, easy assembly, etc. Just in case you wish to have a different design, go for this outdoor bistro set. Next on the out best outdoor bistro set review list is an extremely easy to assemble unit. 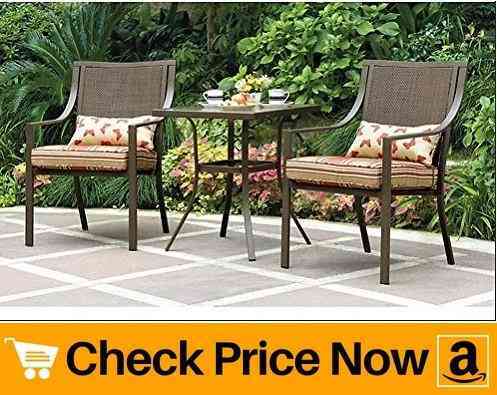 This patio set from better homes and gardens offers a comfortable pair of chairs along with a table. Putting the parts of the unit together is so easy that even a teenage child can perform it. And above all, the fully-cushioned chairs will continue to provide you comfort as long as you sit on it. Hand woven wicket table is weather-resistant. Therefore, arms and body of the chairs is also faux wicker with reddish brown finish. Further, the round base of of the chairs gives them amazing look. Though the chairs swivel a little but they do not rock. Thus, you can enjoy your drink comfortably without worry of pouring it down. Next on out review list we have a simply yet sturdy folding bistro set. Especially, the large surface of table makes the unit include in our list. Also this rattan patio set is strong and have beautiful wicker on the base and back of the chairs. And each individual chair can hold weight up to 300 lbs. For added comfort, you can place your favorite cushions on the chairs. Apart from that, the legs of the furniture are of powder-coated steel. Hence, which means the product is strong and sturdy. One amazing thing about folding bistro set is they do not require any assembly and so does this unit. While the folding property makes them easy to carry, they are also space saving. When the unit is not in use, you can simply fold them and store them. Plus the chairs fold up smoothly without the need to apply extra pressure. 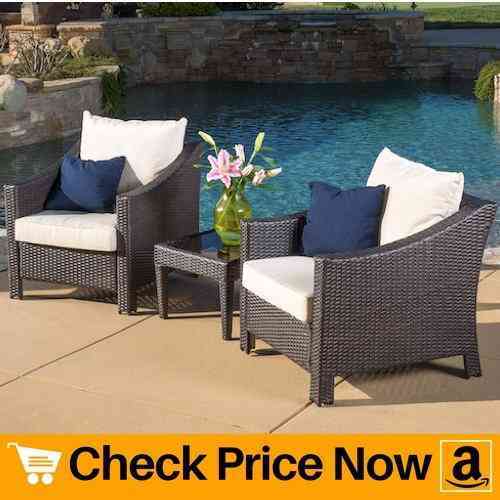 Thus, best outdoor bistro set for wicker loving design. Moving ahead, we have an outdoor bistro set proudly made in USA. This wood like looking furniture set is actually heavy plastic. Apart from that, the quick-fold feature makes the unit easy to carry with you during picnic, camping, etc. 28 inch tabletop provides enough space to fit in dishes and glasses. It also contains umbrella hole which can fit any standard patio umbrella. Talking about the strength of the chair, they have maximum capacity of 250 pounds. Thus, it can fit large people without breaking. Plus they are light in weight and the resin material is long lasting. And surprisingly, this unit does not cost much. 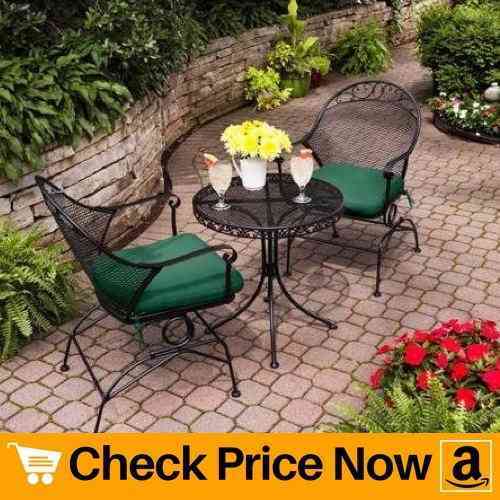 Therefore, it falls under the category of cheap outdoor bistro set. Rocking chairs along with comfy cushions on seat panel makes outdoor time more relaxing. And to make you feel more comfortable we have this product on our best outdoor bistro set reviews. Clayton court offers a fabulous design along with cushions on seat. This 100% jacquard woven fabric is treated for UV-protection. Therefore, it will not fade away easily in direct sunlight. Besides that, it is water, stain and mildew resistant. Putting all parts together requires maximum of 45 minutes. However, the assembly time reduces to 20 minutes if 2 persons work together. Apart from that, the rim of the table have beautiful design as well as mesh structure on the top. Similarly, back of the chairs also have mesh-type design. All together, makes the whole unit look classy. And above all, strong construction makes it best value for the price. When style meets with sold color, a beautiful product comes out. 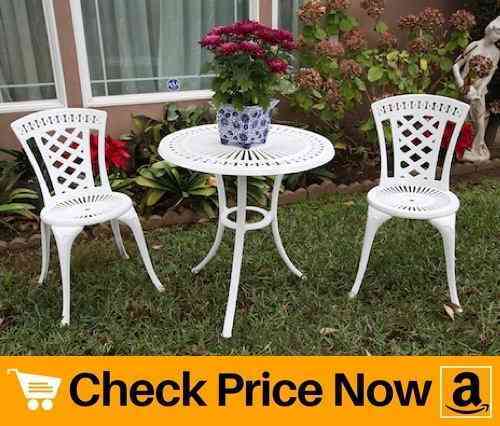 And so is this white bistro set from outdoor patio. Its alluring design on table top and chairs will gather you a lot of compliments. Not only is this product eye-catching but it is also comfortable. Curves on the back of the chairs adds comfort while you spend time outdoors. 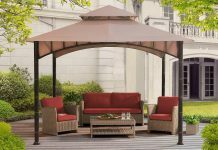 Also the table top consists of umbrella hole wherein you can fit any standard size patio umbrella. Whole unit is constructed using aluminium. This in turn, is responsible for product being light in weight. And due to its lightweight, you can easily shift the furniture from your patio to garden or anywhere you like. Furthermore, the wide legs of the chair provides stability and reduce chances of it being wobbly. Last on the list we have this outdoor bar height bistro set. 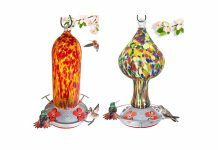 This astonishing 3-piece set is best to place in your patio or deck. What makes this product more interesting is the use of cast iron in building the frames. And making use of cast iron makes the product strong as well as does not rust easily. Thus, the unit will keep looking new for many years. The woven pattern design on seat panels and back of the chairs further adds beauty to the whole unit. Plus it is comfortable to sit in. And for more comfort, you can add cushions. Height of the chairs makes you feel different from regular bistro sets. Interestingly, footrest on the chair also have decorative pattern. Thus, enjoy drinks and snacks in a comfortable and non-wobbly chair. All the above listed patio furnitures are well accepted by customers. From amazon reviews to personally using them we know that they are made from best quality material. 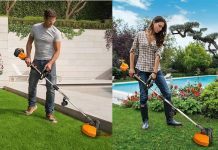 Use them to decorate your garden or backyard.You can find more garden product reviews on home stuff pro. 1. 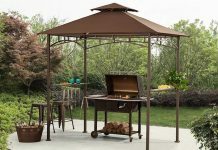 What is an Outdoor Bistro Set Furniture? An outdoor bistro set is basically small piece of dinning furniture that includes chairs and a table. 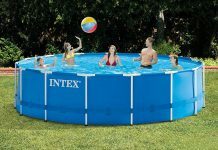 Generally, people consider this an as outdoor furniture suitable to place it in patio, deck, poolside, garden, backyard, etc. Besides that, people also make use of bistro sets in apartments and small-space balconies to take a break and relax. Thus, enjoy supper and drinks in more relaxing way by making use of outdoor bistro set. 2. 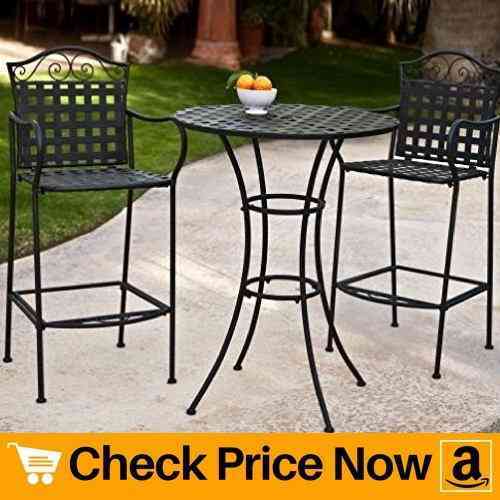 Should I buy Metal Bistro Set or Wooden? In the list above you might have come across many metal bistro sets. These kind of products are generally light in weight as compared to wooden ones. No doubt, wooden bistro sets are also very strong but problem arises when weather gets rough and you need to shift the unit indoors. Due to its heavy weight it becomes impossible to shift such unit quickly. And as a result the wood might get soggy and prone to bacteria and fungal growth. This often results in rotting of the wood along with bad smell coming out from it. To overcome such situations, manufacturers now pay more focus on creating units that are strong, sturdy and light in weight. So we have more options in metal bistro sets than wooden ones. In conclusion, you can definitely make use of wooden bistro sets if you have a fully covered patio or deck. But in case of open space, we suggest to make use of metal units. And so does our list have fantastic metal units to get you your best outdoor bistro set.